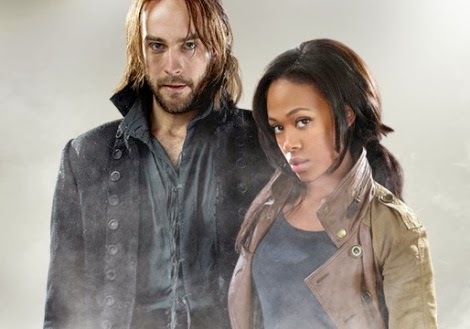 This entry was posted in cross genre, Fox, historical, Ichabod Crane, Jordan Dane, National Treasure, Nicole Beharie, Phillip Iscove, Sleepy Hollow, Sleepy Hollow Writers, sleepyheads, Tom Mison, Washington Irviing by Joe Moore. Bookmark the permalink. I managed to catch an episode during a visit back home this past October and, even during that single viewing, it struck me as a well-written show. If it ever comes to Blighty (on a channel I can get on my basic free-view), I’ll be sure to catch it. I grew up in the area where the REAL Legend of Sleepy Hollow took place (I went to Ichabod Crane high school, even) so I am a little miffed at the liberties taken with our beloved local-hero, but at least now people don’t look at me in disbelief when I tell them the name of my alma mater. Very interesting, Michael. Didn’t realize there was a high school named after Crane. Yes, the show takes liberties, but it portrays Crane in a heroic light, and in a creative way. The show is reviving interest in the legend. Thanks for sharing your history. I haven’t watched anything other than the pilot which I saw without sound on a plane (which doesn’t really count!) Sounds though like it’s totally my cup of tea so I’ll have to see if I can play catch up over the holidays! I had missed the pilot and it’s not easy to find since it’s not ON DEMAND with the rest of the episodes, but it’s good to see them in order. Definitely worth the effort. Writers should appreciate this show, even if it’s not their normal cup of tea, if they break it down for its many rich offerings. Hrm…may have to check it out when I get to a point of being able to watch TV. I love shows that combine history with a good story, especially if they get the history mostly right…or at least believable. Shows like Quantum Leap were my big favourites years back. This one sounds even more interesting. Basil- This show is like looking into your head. Scary thought, I know, but I can guarantee you will find many gems that could inspire your hefty creativity. It’s definitely your thing. OMG, love this. Can totally see him channeling in his Oxford professor father’s footsteps. In an interview, Tom slipped and said Ichabod would be forced to change. Hmmm? Middle English hadn’t been spoken for well over a hundred years when the Roanoke Colony was lost. Heck, even Elizabethan/Shakespearean English was fading away. That’s not to say that the average American could completely understand the colonists, but the average English major could figure it out. That’s the biggest historical gaffe made so far. The writing is excellent, and the writers/creators haven’t let success mess things up, and I hope they won’t. In praising the series, let’s not forget Headless’ demon Lipizzaner stallion who does airs above the ground, offers serious eye candy, and brings help to Headless. I call the horse Lassie Lipizzaner. The show is filmed in Wilmington, NC, with many of its outdoor scenes filmed in Salisbury, NC. Both are so warm, even in winter, that poor Mison in his wool coat is probably cooking. Let’s hope the poor man gets some cooler, trendy clothes. Hi Marilyn. Yes, Tom said in an interview that NC humidity is killing his heavy jacket sweltering body. On the Middle English, they consulted with a scholar and got a linguist to help the cast. It seemed well done to me and kudos to them for the effort. Thanks for joining in the chat. The white stallion is stunning. Don’t be sad for the finale of Sleepy Hollow. Be filled with joy at the return of Justified on January 7 (just in time for my birthday). I’ve been enjoying Sleepy Hollow, too, for many of the same reasons you mention. One you didn’t is that these two are working together, and neither one of them has the expectation of a romantic relationship with one another. One of my pet peeves is the whole well-if-they-work-together-they-must-want-to-sleep-together attitude that you see between male/female leads on a lot of tv shows. Cause, you know, that happens all the time (I’m rolling my eyes). They’re also both intelligent characters. Unlike you, I can’t wait for him to get some new duds. Every time I look at him in that 200+ year old jacket that he wears day in and day out, all I can think is that thing must be awfully rank. I keep expecting someone to come up to him, gag, and say “Dude! You stink!”. I’m not a big fan of corduroy. I think a military inspired men’s jacket would do him justice. Take a look at the jacket here http://trendseve.com/mens/mens-military-inspired-jackets.php/attachment/mens-military-inspired-black-jacket and you’ll agree he’d look mighty fine in it. I enjoy the fish out of water bits – the Onstar scene was hilarious – but I’m glad they don’t do them all the time. I wouldn’t want it to be just a fish out of water show. That would get old fast, plus it makes those bits so much more special when they happen. Wow, the military style is a very cool idea. I think he’d gravitate toward the familiarity of style & function he understands. Agreed. And I am eagerly awaiting Justified & Hannibal. All these shows have excellent writing, yet are quite different (except for their goal of striving for excellence in a sea of mediocrity). There’s a formality to the period attire he would seek out, like a jacket to cover the feeling of being naked in just a shirt (as I’ve researched of the time). Poor Tom may be suffering through NC humidity if his wardrobe sticks to something Ichabod might choose for himself. I am most certainly a Sleepy Head and have been enamored with the story line from the start. Any writer who can successfully twist folklore and mix it with history holds high marks on my ‘way to go’ list. 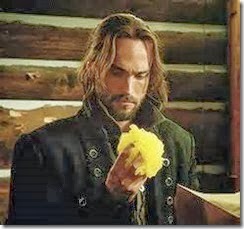 As for what Ichabod might choose to wear, he’d select on the practical side: jeans, sturdy boots, a coat reminiscent of the frock he currently wears and in natural fibers with plenty of movement. On my Jordan Dane Fringe Dweller blog, I put together images of clothes he might choose. A fun project. Thx, Jeannie! This is also one of my favorites, and definitely my favorite new show of the season for all the reasons you stated, Jordan. I’m in the minority I suppose but I like Crane being in his old clothes. Sure I get in real life they’d be smelly or would have probably disintegrated by now, but artistically they are his ‘uniform’, what makes him standard as different–visually. Plus I get his attachment to them. They are his only link left to who he was and where he came from. Another point that bothers me–I was born and raised in Westchester County (where Sleepy Hollow really is)–and I have to grit my teeth every time they mention the Sleepy Hollow sheriff’s department. There’s no such thing. Sheriff’s department’s are county level agencies, not part of a town like they have them here. Patrol and investigations are handled by the Westchester County Police, a separate agency. Why do they need two agencies–I have no clue, but they do. None of that is either here nor there, just figured if we have to change Crane’s clothes to be realistic, I guess the name of the department should be right, too. All that said, I can envision a pretty funny scene with Mills and Crane trying out various styles of clothes. I think Crane would elect to keep his old ones. Hey, David. A sheriff allows for small town living and containment of what’s happening is easier, but I had a feeling the jurisdiction wasn’t right. A shopping spree could be fun. I think Crane wouldn’t play a Ken doll, but a change in clothes is practical. He’s got to be tired washing his clothes and drying with a hair blower. Like you, I like his period clothes, but now that they got season 2 in the bag, the show has to address his attire. Check out my Jordan Dane Fringe Dweller blog for images I think would work. Thanks, David. Tom would look good in anything, but Crane is so sassy and opinionated, I would imagine he’d have opinions about practicality and clothes that “feel” familiar. His attire is the last vestige of his time. I think it would signal a significant line to cross, one of acceptance of his role in present day. Thanks, Robin. I’m a Sleepyhead who live tweets every episode under my pen name, Dax Varley. Love Orlando Jones’ live tweets. The man’s hilarious. While the writing is good, there are some cheesy moments that make me love it even more. It’s overtaken Supernatural as my favorite TV show. I live tweet under @JordanDane. That’s why I record to watch later, but the live tweets are so hilarious. I also send messages to Phil Iscove, a co-creator & writer for the show. I love how active the actors are online while the show is on. It helps build a following. I’ll have to pay more attention to Orlando. My inner smart a** comes out and I respond to other sleepyheads as the spirit moves me. The tongue in cheek humor of the show and Mison’s brilliant delivery and wonderful acting makes this a must see for me. 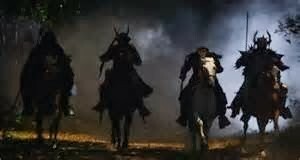 As a writer myself, I am drawn to well written shows and I have several top favs now – Hannibal, Justified, and now Sleepy Hollow. Another show I like that has the same irreverent humor and dartboard approach to putting a plot together is Banshee. The acting is great and the dark humor is noteworthy. Thanks! I’ll check it out. You’ll see my tweets under @daxvarley. The new Hannibal is graphic, but Hugh Dancy (Brit) is amazing as profiler Will Graham and Mads Mikelson plays Hannibal, redefining the role. A brilliant take on the Red Dragon book by Harris. If you have the same taste as I do, you’ll love it. What is up with these gorgeous Brits? You can’t go wrong dressing that guy in anything. Thanks, Audrey. The writers and producers said they’ll be updating his clothing, but it’ll still have that a hint of Revolutionary period look. I totally agree, Dotti. Crane would need to feel comfortable in any change.